The Branch and The Vine is bringing a new experience to downtown State College for chefs and foodies. The olive oil and vinegar taproom, which opened in late October at 246 East Calder Way, offers patrons the opportunity to taste a dozen different balsamic vinegars and 15 olive oils infused with different flavors, all while offering a wide array of other products. Co-owners Kevin Kassab and Tom Tate got the idea three years ago to bring a taproom to State College when they came across one while traveling for the wedding of Kassab's daughter. "We just fell in love with the store and fell in love with the idea," Tate said. "We thought State College could use one of them. There’s nothing like it here. It’s a really interesting concept." Visitors can try any of the olive oils and vinegars, dipping them in bread, or, if they prefer, drinking them straight. More flavors are being added all the time, Tate said, and the shop will rotate flavors in and out. The concept has grown in larger cities, from Pittsburgh to New York, and has begun expanding to smaller towns. In State College, The Branch and The Vine already has met with a positive response. "It’s been good. A lot of foodies like this type of place, a lot of people that are really into cooking," Tate said. "A lot of chefs in the area, if they make specialty salads, it would be good for them to step in and get vinegars and a couple of them have." For those who may be less interested in the oils and vinegars, though, the store has a wide range of culinary products. The shop offers salsas, barbecue sauces, hot sauces, salts, spices, dip mixes, granolas and more. Tate said the store's most popular offering is maple bacon onion jam, which tastes great on bagels, grilled cheese and chicken pizza, to name a few pairings. "People absolutely love this and we keep running out of it," Tate said. "I’ve gone through three cases since we opened and I just ordered four more cases." The Branch and The Vine also is working to acquire a license to sell wine, and once licensed would sell offerings from University Wine Company. Most of the products sold are from Pennsylvania. 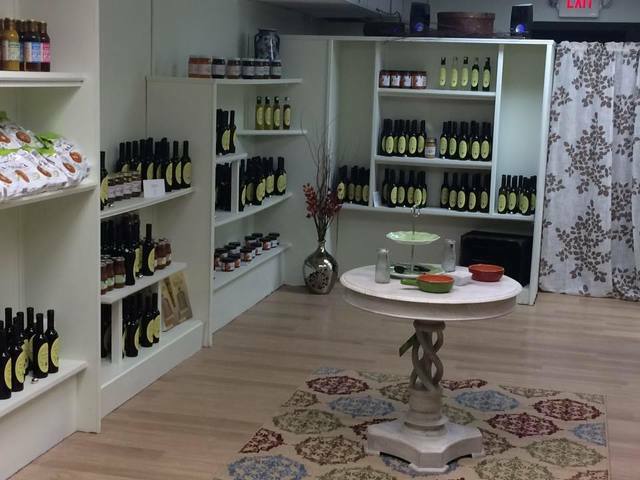 The vinegars and oils are brought to Pennsylvania by an importer in Garnet Valley, Pa., who gets them directly from his family in Modena, Italy. Tate hand bottles all the oils and vinegars himself. "They are very fresh," he said. "They're not sitting on the supermarket shelf for months." Tate said some people may be surprised to learn about the health benefits of olive oil and vinegar. Research has indicated olive oil can have a positive effect in reducing the risk of type 2 diabetes, stroke, heart disease, depression, skin and breast cancer and osteoporosis. Vinegar, Tate said, also has heart health benefits. The balsamics also are versatile. Tate said they are great for cooking with meat and one of his favorites is the vanilla fig on pork chops. Several varieties, like raspberry and chocolate, work well poured over ice cream. And for those looking for a holiday gift for the foodies in their lives, the shop makes gift baskets and boxes. To explore what The Branch and The Vine has to offer, the shop will be holding an open house on Friday evening as part of Downtown State College's First Friday. In addition to trying out the taproom's offerings, visitors can enjoy cheese trays from W.C. Clarke's and vegetable trays. University Wine Company will offer samplings and bottles for sale, and a violinist will perform from 6-8 p.m.
For more on The Branch and The Vine, visit the shop's website and Facebook page. 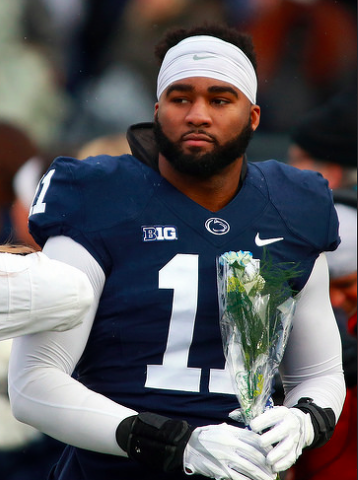 With 18 tackles to his name on Saturday night, Penn State senior linebacker Brandon Bell has been selected as the Walter Camp National Defensive Player of the Week after his Senior Day performance.